Regional solutions to promote affordable housing through dialogue among state, federal and local stakeholders. 7th Annual San Joaquin Valley Affordable Housing Summit - "The Future Valley"
California’s housing crisis is just as pervasive in the San Joaquin Valley as anywhere else in the State. How will our region respond to the unique challenges and opportunities our communities face? 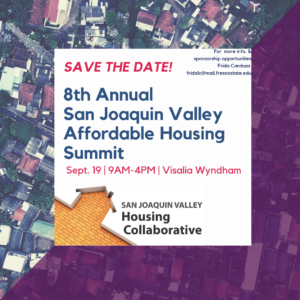 Join housing specialists, community development professionals, elected officials, service providers, and community advocates for the 7th Annual San Joaquin Valley Affordable Housing Summit. This year’s summit is sure to be the biggest yet, offering more workshops, round-tables, and networking opportunities than ever before. The San Joaquin Valley Housing Collaborative focuses on regional solutions to promote affordable housing via dialogue among state, local, and federal stakeholders. The San Joaquin Valley has long suffered as the epicenter of the nation’s housing crisis. As of December 2011, unemployment rates ranged between 14.7% in Madera County to 18.7% in Merced County, well above state and national averages. Poverty rates are also some of the highest in the nation, ranging from 15.7% in San Joaquin County to 24.6% in Merced County, as of the 2010 census. Additionally, several valley cities have consistently ranked in the top five hardest hit foreclosure areas in the nation, with 1 in every 140 housing units in San Joaquin County in foreclosure in January 2012. These already sizable challenges have been exacerbated by the loss of redevelopment agencies and consistent budgetary uncertainty among local agencies.